Mk 3. 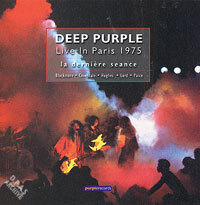 Recorded at Palais des Sports, Paris, France, April 7th 1975. CD1 - Burn / Stormbringer / The Gypsy / Lady Double Dealer / Mistreated / Smoke On The Water / You Fool No One. 2CD (See photo) Properly remixed from the multi track masters, with edits restored.